BTRTN: Unintended Consequences? Does Trump Have Any Intended Ones? Tom with the BTRTN July 2018 Month in Review. The month of July was arguably the worst month for President Trump in 2018. Trump’s crude attempts to re-shape the existing world order into, um, something else, continue to reveal a man who makes it up on the fly, who cannot get beyond his stump speech bromides for all that ails America. Trump is far from being humbled by – or even acknowledging -- the awesome potential of the unintended consequences of his actions. Indeed, Trump appears to give little thought to what consequences he intends. Is there a purpose, apart from drawing attention to himself, to it all? · The Helsinki press conference brought into sharp relief perhaps the central enigma about Trump: what is he trying to accomplish with his unabated Putin groveling? One reason why the “Putin must have something on him” theory (that underlies the “collusion” hysteria) has such force is that no one in Trumpworld has been able to offer a sensible alternative theory that explains any of his actions. 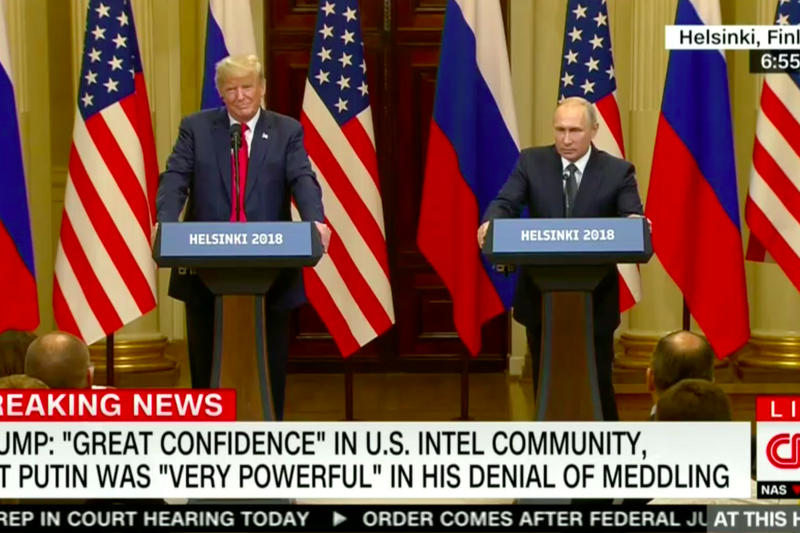 The press conference – in which Trump backed Putin’s assessment of Russia’s interference in U.S. elections (“none”) over his own intelligence community’s unanimous assessment (“yes, to the max”) – was a stunner. There simply was no reason why Trump could not have at least chastised Putin publicly for the interference; doubtless that’s what Putin might have reasonably been expecting. And in the aftermath of outrage, in trying a rare “walk back” of his performance, Trump proved himself a parser on par with the master himself, Bill Clinton, in dissecting the difference between “would” and “wouldn’t” – as if that one syllable change tidily clarified his obsequious behavior throughout the entire press conference. · What is Trump trying to accomplish in undermining the NATO alliance? Does he realize that the more he rips his allies, the further he accomplishes Putin’s primary objective of dividing us, weakening the united front we must show in the face of his next strong-armed attack? Does Trump really view NATO as simply a balance sheet: if Europe is not spending its fair share on defense, that means the whole alliance is wrong, and the EU is actually our “enemy”? Is that goal – apparently to up Europe’s defense spending -- worth undermining the architecture that has kept the world from World War III over the last 73 years? Is there any good strategic reason for declaring that Germany is “a captive of Russia” or critiquing Theresa May while on her own soil? · Does Trump understand that he has given away two huge chips to North Korea – sitting face-to-face with Kim Jong-un and agreeing to end U.S./South Korean joint war games – without getting anything in return? And indeed, with new evidence that North Korea is now building several liquid fueled ICBM’s, does he understand he has been played? The abrupt failure of Mike Pompeo’s follow on trip to begin detailed negotiations with North Korea should have been ringing alarm bells, but instead Trump the Appeaser now wants to sit with Iranian leadership “whenever they want.” Apparently he thinks he is on a summit winning streak, an assessment shared by exactly no one on either side of the aisle. Meanwhile, the Mueller investigation grinds on, with the indictment of 12 Russian spies so thick with detail on election interference that they defy any possible rebuttal -- though Trump, of course, did just that in siding with Putin just days after the indictments. Then Michael Cohen started chirping, if not formally via a plea bargain, then certainly through the press. First, he released a tape of himself and Trump discussing the payment process to be used to quiet playmate and Trump paramour Karen McDougall, clearly undercutting Trump statements about having no knowledge of either the affair or the hush money. And then, Cohen revealed that he was at a meeting – with several other people – in which Donald Trump, Jr. informed his father of the Russia overture, before the infamous Trump Tower “dirt on Hillary” meeting occurred. And Mueller is now in court with the opening of the Paul Manafort trial, and the stunning revelation that the former Trump campaign manager had made $60 million in his sordid relations with the Putin-backed bad guys in Ukraine. There was more in the month – the trade war that is officially underway with China, the failure to reunite more than a small fraction of the children separated from their parents in the “zero tolerance” debacle, the threat to annihilate Iran. Any of these might have been lead items under another president. But here, and now, these are lost in the cacophony of an continuing, erratic drumbeat. The only constant is Trump’s approval rating, which remains as still as a quiet pond in New Hampshire, lazing along at 43%, right on average for 2018. The generic ballot for July remained at +7 in favor of the Democrats, which has been a pretty steady level for the last 12 months. Using our proprietary BTRTN regression model, this lead would suggest a 38-seat pick-up for the Dems in November (if it held). We calculate the Dems’ odds of taking over the House to be 82% as of this moment. The “Trumpometer” increased to +26 in July, driven by the +4.1% GDP growth in the second quarter of the year. Economists downplayed the long-term significance of the number, citing the stockpiling of newly-tariffed items as a key driver, and warning that the lofty growth number will fade quickly. The stock market increased a bit in the last month, while consumer confidence inched up a point. The unemployment rate increased to 4.0% (which is actually a good sign as more return to the job searching market) and gas prices held. The +26 Trumpometer reading means that, on average, our five economic measures are +26% higher than they were at the time of Trump’s Inauguration.